Interested in yoga, but confused where to start? 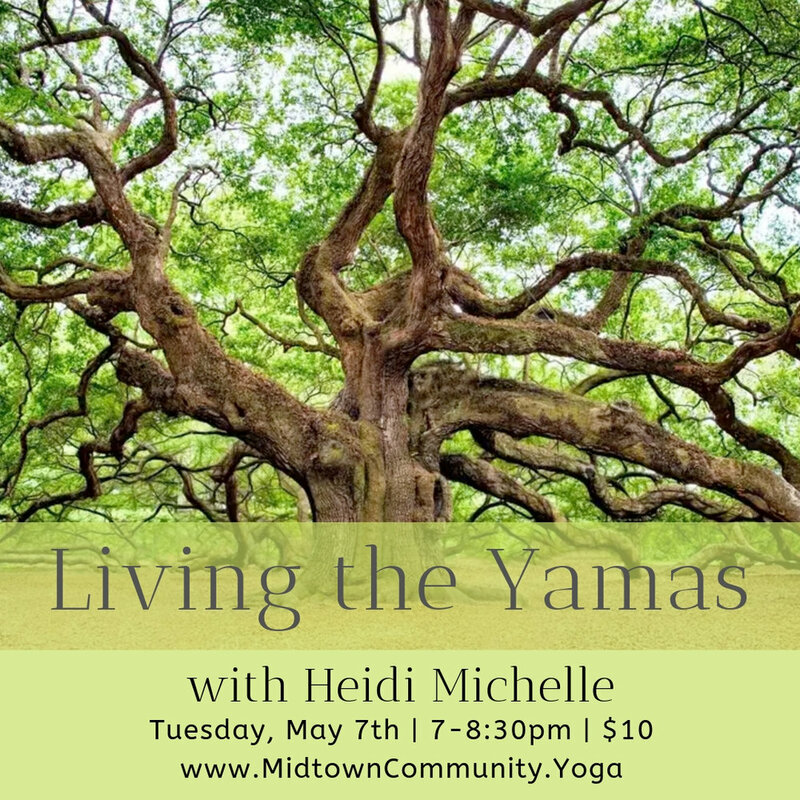 Join owner, teacher, and yoga student, Ellie, for 4 weeks of yoga basics, introducing you to the fundamental principles of a yoga class and giving you information on what to expect from the different styles of yoga that we offer here at Midtown. This semi-private group instruction will get you all caught up on the foundations of yoga, including basic postures (asana), moving with the breath (vinyasa), and how to use our props to make safe modifications for your body. You’ll leave the series armed with knowledge and experience to choose which styles and practices you want to explore, with confidence to be comfortable in class. $88 Commitment. Limited to 6 students. $250 for Full Weekend. $55 per Class. Sign up on our Schedule Page ! FREE Classes for MOMs on Mama's Day!! Learn more about this traditional lineage, and establish a practice in Ashtanga Yoga with Carol Curry. Beginners to Mysore Style Ashtanga start the 1st of each month. These Introductory sessions will include individual instruction in the Mysore Room, which is open to you Monday through Friday 5:30-8:00am, and 2 philosophy discussions on the first and third Saturdays of the month at 7am. You will learn about the history and the lineage of Ashtanga Yoga and many other topics including: pranayama (breath control), bandhas (energy locks) and other subtleties to deepen your knowledge and experience. 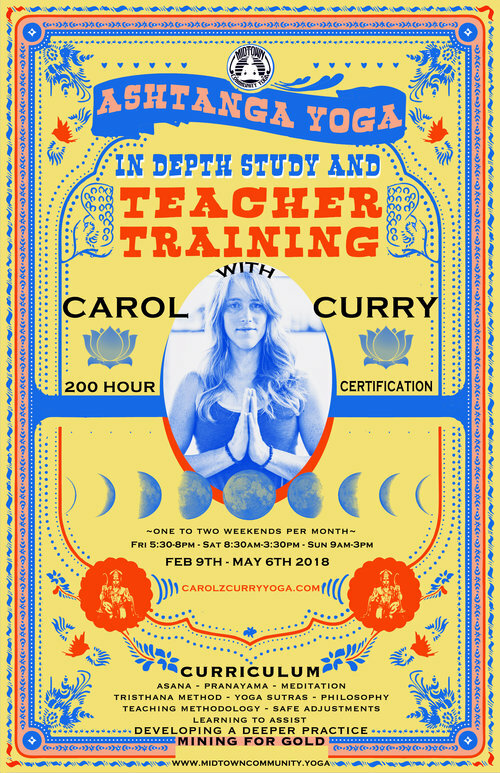 Students will come to early morning practices with Carol to learn sequencing and postures individually, progressing as you're ready, growing at your own pace. With special attention to basics, these beginner sessions are a great way to prepare you to integrate into the Mysore Room. Regardless of your level or experience, Carol will meet you right where you are. You will learn to practice at your own pace, moving with your own breath, while learning the Tristhana method, becoming fully integrated and established as an Ashtanga Practitioner. Practice will be about 30 minutes to start and expand to as long as an 90 minutes with experience. $150 commitment includes one month of unlimited yoga at Midtown, with specialized beginner instruction, TWO Philosophy Sessions, and lots of personal attention. Regular pricing applies. $10 Drop Ins for non-members. Included in class packs and memberships. Join Sarah Hannala for a 2-hour immersion in love and community. With yoga translating to union; we will practice coming together as vulnerable humans, as well as tying together the loose strands of the mind. We will break down the walls surrounding our hearts and open ourselves up to a space of surrender through pranayama, meditational movement and expressions of love. We come together, in order to find ourselves. 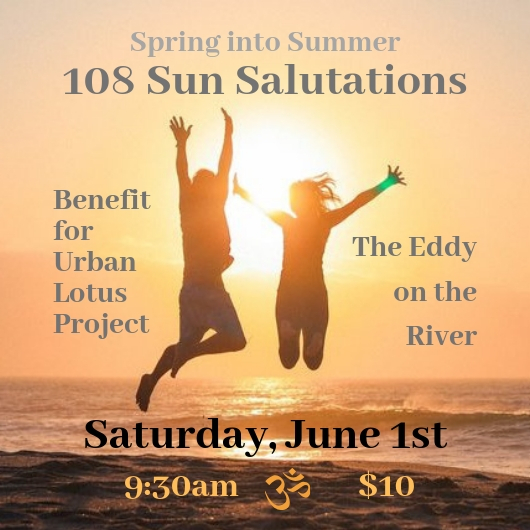 Join Kathleen Ames for YOGA NIDRA, a 90 minute guided meditation leading you to deep relaxation. $2000 Commitment. $500 Deposit due at registration. • Make new friends while sampling tea from Sol Kava Bar! • Create your own beaded Mala to jumpstart your meditation practice! • Learn about mindfulness from healer and speaker Leigh Hurst! • Experience the benefits of yoga for mental illness in a yoga class for beginners! Class taught by experienced teacher of yoga for mental health - Jennifer Duvall. All Levels Yoga lead by Megan with sweet musical accompaniment from our very own Rachael. $10 drop ins for non-members. Included in class packs and memberships. FREE CLASSES for Breast or Gynecological Cancer Survivors. Sponsored by Pinocchio’s Moms on the Run! Wednesday, January 3rd, 10th, 17th, 24th & 31st! From 6:00 pm to 7:15 pm. Designed by a breast cancer survivor to be therapeutic to the needs of the student currently going through treatment or in recovery. This gentle yoga class will stimulate muscles, increase blood flow, balance the glands and enhance the lymphatic flow in the body. Resulting in enhancing your body’s internal purification process and helping to relieve tension and anxiety. You will feel a sense of well being after each class. Please call Susan @775-772-3892. Arm Balances & Inversions with KIM. Sunday Mornings at 11. Join Kim Arnott one Sunday per month for her Arm Balance and Inversion Workshops and Intensives, exploring helpful topics to help you get upside down and all of that. 3 WORKSHOPS will be Sundays from 11-1:30, covering helpful topics of balancing and inverting. $30/each or $75 for all 3. 2 Continuing Education Credits can be earned at each workshop, with a total of 6 credits if attending all 3. 90 minute Arm Balance &Inversion INTENSIVES will be held during non-workshop months. July 9th, August 6th, October 8th, & December 3rd. 11:00am-12:30pm. Intensive pricing will be included in Memberships and Class Packs. Non-members can sign up for regular Drop In Pricing. Tim Miller Weekend in Reno. OCTOBER 13-15, 2017. Tim Miller makes his way to Reno for the first time for a full weekend of workshops! Reserve your space now, as this workshop is filling up fast. $300 for all 5 sessions, $65 for individual sessions, or $125 for Full Days Saturday or Sunday. Purchase Individual Sessions by visiting our Schedule Page. Select the Session you are interested in to sign up and pay. Exploring the Bandhas ~ Light Asana Practice and Pranayama. Led Primary Series (Strong Asana Practice), Yoga Philosophy, and Hanuman Chalisa. (No Asana Practice) Bring your questions regarding asana, anatomy, philosophy, pranayama, and/or Vedic astrology. Hear Guruji stories. Tim Miller has been studying and teaching Ashtanga Yoga for over thirty years and was the first American certified to teach by Pattabhi Jois at the Ashtanga Yoga Research Institute in Mysore, India. Tim has a thorough knowledge of this ancient system, which he imparts in a dynamic, yet compassionate and playful manner. “My goal as a teacher is to inspire a passion for practice. The practice itself, done consistently and accurately, is the real teacher.” Tim teaches workshops and retreats throughout the United States and abroad, as well as at his studio, Ashtanga Yoga Center, in Encinitas, CA. I am so happy to welcome Megan Lee Hislop back to Reno and even more excited that we are going to be teaching therapeutic acro together atMidtown Community Yoga. This workshop is part of a series of classes and workshops we are teaching together between Reno, Nevada and Asheville North Carolina this October. This workshop in Reno will focus on different aspects of therapeutic touch and intent both on the ground and in the air. • combine aspects of l-base acro, bodywork, and partner stretching into a sequence of poses that balance the body and mind. ** You do not HAVE to attend the all levels Acropeutic prep/intro class Monday October 2nd, 7:30pm at Midtown Community Yoga in order to participate in this workshop, (as long as you have some experience with acro) but you will be missing some specific time spent with a focus on refining our therapeutic touch for acrobats. October is National Breast Cancer Awareness Month! Join Susan Hoog Wednesdays 6-7:15p, throughout the month for FREE Yoga! A benefit event to raise money for the victims of Hurricane Harvey and Irma. Together we can make a difference while bringing awareness to the greater issue at large. Hurricanes Harvey and Irma have affected tens of millions of people in the last few weeks. Homes and infrastructure have been destroyed. Tens of thousands of people and animals have been displaced. Crops lost. This event follows a broader trend of increasing extreme events. In just the last year, catastrophic infrastructural damage, deaths and financial losses were caused from floods in the Bangladesh, Niger, Nepal, and Peru; while droughts and fires of El Niño affected 60 million people across the African continent. We can’t stop natural disasters, but we can reduce the impact of poor urban design, preparadness and inequality. On September 24th we will come together to build a beautiful community; discover tools to restore and rejuvenate the internal ecology of our body, mind and heart; celebrate and act. • Conversation with climate change conservationists and specialists. Suggested donation: General ($15), students ($10) or ANY AMOUNT you are able to offer. All welcome, regardless of your ability to pay or yoga experience. We love the Humans!